Josh in Rocky River is among the youngest of Century Cycles' mechanics, but this picture is proof he has many years of experience. 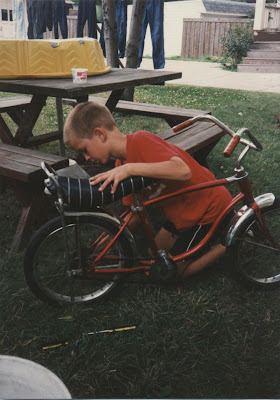 He says that bike he's working on was handed down to him after every other kid in his family rode it. He does not remember what repair he was making when his mom snapped this picture. i wish i knew what kind of bike that was. it was a beast (of pint size proportions) we took that thing off some sweet jumps....jumps that felt like 3 or 4 feet. although in actuality they were more like 6 or 7 inches. oh to be young again.....i guess i could just go to rays!